Select a piece of music (preferably classical or at least rhythmically complex) and allow your movements to be affected or generated by it whilst producing a drawing. To begin with, generate your lines and marks solely in response to the music. After the first hour, develop this further. For example, you could introduce an observational element such as self-portraiture and begin to explore the interplay between gesture and representation. Alternatively you might decide to video yourself making the work to emphasise the performative nature of gesture. Pollock was the forefather of action painting and ‘letting your inner emotion be dictated on canvas, thus I thought this would be a starting point to how to paint the feeling of music, i.e. transferring your feelings for a piece onto a two dimensional support. Music is heard by the ears and interpreted by the brain and often provokes a feeling be it mild or extreme. Depicting these feelings would be the challenge of this assignment. 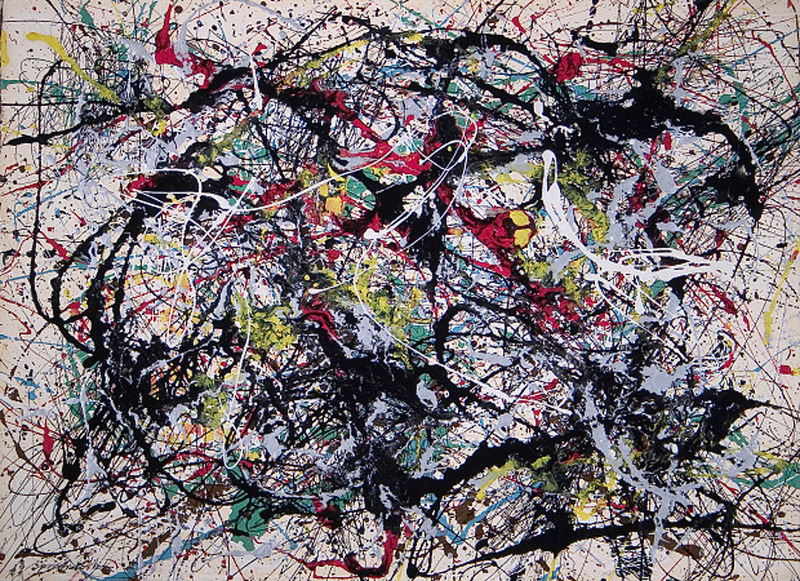 The Pollock research and paintings ‘looked at’ is an appendix to this write-up. Building on earlier exercises in this section of the course I decided to introduce some elements to the assignment piece. I blindfolded myself for much of the work produced for the assignment and also added the randomness of a ‘drawing machine’ element to it too. Using a ‘lazy susan’ rotator device I glued a large drawing board to it before attaching the paper. The paper used for this music exercise is ‘sheet music’ chosen at random. This was extracted from a 99 pence charity shop bought book and used as the support for these preparatory drawings and the main assignment pieces. My favourite form of music is ‘Jazz’ so I lined some jazz, paper, a quiet room and various media and pressed ‘play’. The Jazz chosen for these exercises was a selection of pieces which I have listed below. Also listed below are the further pieces of music I listened to as the drawings progressed. Started with Jazz Blues and then onto the more structured classical sounds of Vivaldi. Ascenseur pour l’échafaud, Le Poste Parisien Studio Paris 1957. Blindly spinning the drawing board with the music playing I responded to the sounds and feelings of the Vivaldi’s Four Seasons. The drawing mediums utilised were Derwent Artbar and Inktense blocks. All the colour drawings below were draw to the sounds of Vivaldi. May’s rendition of these classical sounds of the seasons had to be done in colour I felt. Changing the drawing colour at each change of music piece I created the drawings above and below. I have referenced the drawings with the season of the music piece. I especially like the four coloured charcoal pieces. [Ref. P8 A, B, C, D]. The responses to the Vanessa May Vivaldi music are referenced 6 to 10, some with sub references. The later monochromatic drawings are the response to the sounds of jazz. The sounds of piano, clarinet, saxophone can create some haunting and soulful sounds and well as being upbeat. Black ink on white paper (music score paper) seemed to be the most appropriate medium for the response to jazz blues. The jazz responses are noted in the drawings 1 to 5 and the final assignment pieces. The final assignment pieces were done Jackson Pollock style – in the garage with a space cleared to allow the splashing of paint / black ink. The rotator drawing board was again utilised to spin the paper as I listened applied the ink in response to Miles Davis mournful and upbeat jazz tones. **** There was a video recording done of the production of the final pieces but unfortunately the camera memory has been corrupted and these videos are not working!! Limited sheet music paper restricts doing another video immediately. For the assignment pieces I utilised old sheet music with vigorously applied paint. The paint was applied when the board was spinning and a dripping brush loaded with black ink was waved in response to the blues jazz resonating alongside me in the garage. This exercise was not for the faint hearted or the tidy. Despite protecting myself and much of the garage from splashes i found i was covering everything in spots and splashes from fine spray to big drips of ink. My wife was aghast and hurriedly got out of range. The splashes of paint resemble the marks of notes in the sheet music, i wonder can they be translated into notes and played and then this visual art might be also a musical piece. I sure it would resemble a set of pots and pans falling down a set of concrete steps. Loud and not exactly pleasing on the ear! I had a re-visit to the work of Jackson Pollock and below are some of the images and info which formed some of the research for this assignment piece.